Are you in the market for a stylish, precise watch that bridges the gap from office to weekend wear? The TAG Heuer Monaco CAW2110.FC7177 watch blends the best of both worlds with its world-renowned combination of class and accuracy. TAG Heuer is known across borders for its innovative design, legible display and reliable timepieces. 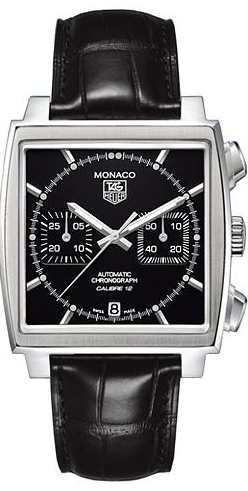 The TAG Heuer Monaco is no exception. 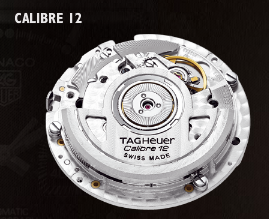 The TAG Heuer Monaco CAW2110.FC6177 has a square case design and is powered by a Calibre 12 Automatic Chronograph, which gives accuracy of 1/8th of a second. The iconic watch displays small seconds at 3 o’clock, chrono minutes at 9 o’clock, and a small date window at 6 o’clock. Its design is sleek and stylish with its black dial, fine-brushed steel case, and black alligator strap. This watch is also water-resistant, it can function underwater up to 100M (330 Feet) and has hands and indexes that light-up to allow visibility in dim places. And because its made with scratch resistant sapphire crystal, your watch will always look brand new. There are a few things to be aware of before buying this timepiece, however. Although it claims to be waterproof, the strap should not get wet because its made from natural material and its color will fade over time. It should be kept dry and far away from showers, baths or pools. The watch should also be kept away from chemicals, such as detergents, cosmetics and solvents in order to preserve its color and technology. It’s also important to note that the water resistant technology is not a permanent function because under time and pressure the watch’s rubber seal will begin to deteriorate. Annual checkups can help prevent this, but again, be weary of water when wearing this luxury timepiece. Another potentially negative aspect of this watch is that when temperatures change rapidly, condensation will form under the crystal face of the watch, but will disappear on its own and cause no harm to the watch. So if you won’t mind taking your watch off before getting wet, the TAG Heuer Monaco CAW2110.FC6177 is worth the money. Its style is versatile and it will keep you punctual with its precise Automatic Chronograph Calibre 12 and simple, easy to read time measurement. With the clock’s water-resistance technology and scratch resistant case, it proves itself to be a durable watch that is bound to last you years and win you many compliments. Cool- this is the world’s first watch that is accurate to 1/8th of a second. Well done Tag!! !